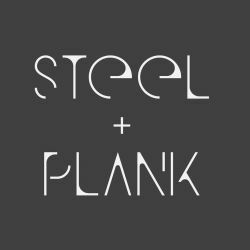 Kelley Bishop is the owner and designer of furnishings at STEEL+PLANK. She is a partner of STUDIO.BNA architects and has practiced architecture for over 20 years. One of their guiding philosophies is to be a good architect one should know how to build. A fabrication shop has always been a part of the studio enabling them to build an entire structure or just focus on a few special custom pieces. Many of STUDIO.BNA’s ideologies cross over to the handcrafted, simple furniture designs of STEEL+PLANK. The pieces are contemporary with clean lines, true to the material of steel and wood. Kelley has also curated a number of artists and makers of art, soft goods, housewares and lighting that complement her furniture designs. Many of the artists and makers are local to the region but it is the quality, craft and understated timeless beauty that is the ultimate driver in selecting what belongs at STEEL+PLANK.